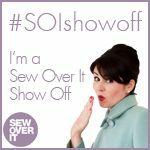 I live in Shetland and love to sew. Follow my blog to see the latest additions to my handmade wardrobe. The weather is finally warming up in Shetland and it is really starting to feel like Spring. Two lambs have been born on the croft and if you follow me on Instagram you might have seen that I am expecting a baby, we are so excited and the baby is due in August 🙂 . To celebrate this I wanted to share an offer code with you, for 25% off the Dora Dress and Top pattern in my Etsy Shop. I hope this post will inspire you to give the Dora Dress pattern a try for your Spring/Summer sewing wardrobe. Use the code SPRINGDORA at the checkout for 25% off. Follow this link to buy the dress. This change of season has inspired me to make some new Dora Dress samples to show how the pattern can be worn during warmer times of year. You will notice I am not modelling these samples, as thanks to my growing baby bump I no longer fit in them, ha! I really enjoyed not being in front of the camera this time. I am definitely not a natural at having my photo taken so it was a relief to get to hide behind the lens and help Aaron to compose the shots. The Dora Dress made up in a cotton lawn fabric is so comfy and breathable and great for hot weather. We don’t get much hot weather up here in Shetland but I did wear a cotton lawn Dora Dress while on holiday in London last year, it was above 30 degrees celsius (very hot for a Shetlander), and wearing the dress certainly helped me cope with the heat. Marjolein, a good friend of mine who you may remember from this post if you have been following me for a while, kindly agreed to model these samples for me. She is an amazing comedian, I would recommend going to see her perform if you get the chance. You can follow her here. The blue and white fabric was from Merchant and Mills and is a beautiful weight and drape for this dress. I love the print. We took these photos at the Lodberries in Lerwick, if you watch the BBC series ‘Shetland’ you may recognise the building behind her as Jimmy Perez’ house. This second version was made using a burgundy poly crepe fabric from Stoff and Stil. Last summer I wore a green crepe version of this dress to a couple of weddings and I thought it made a lovely wedding guest dress. At the beginning of March I was contacted by Fibers to Fabric and very kindly offered a voucher for fabric in exchange for a review * . 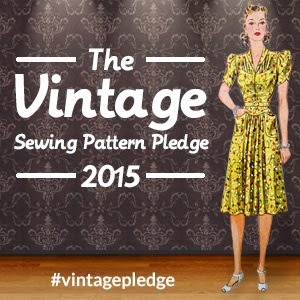 I had a look at their fabrics and was thrilled to be given the opportunity to try them out. I took my time over my choice and eventually decided on this black cotton ikat fabric. There were only 2m left and it was quite narrow in width, so I knew I would be limited as to what kind of garment I could make, but I loved it so much I had to choose it. *I only ever share products and promote things that I love and I think you will too. I was sent this fabric in exchange for an honest review on my blog and social media and all opinions and thoughts are my own. The fabric was shipped from India and I was very surprised when it arrived so quickly, unfortunately I forgot to write down the date it arrived argh sorry, but it was surprisingly quick, especially as I live in Shetland and the postage was reasonable at £3.72. Before pre-washing I overlocked the edges of the fabric, as it looked like it had quite a loose weave, I didn’t want to lose any yardage to fraying. I think this was a good call as the fabric did fray a lot after cutting. I found it easy to work with other than that. It is quite light weight and is extremely comfy to wear. It is 100% cotton and so breathable. I selected the Scout Pattern by Grainline Studios to make with it, as it required under 2m to make. I had been eyeing up this pattern for a while and thought it would perfectly compliment this fabric. I made a few minor adjustments to the flat pattern before cutting. I lengthened the body on the lengthen/shorten line by 5cm. I then added another 5cm to the hem length. I added notches to the side seams 20cm up from the hem to leave open as side slits. This was a very quick pattern to cut out and sew up. I followed the instructions to finish the neckline with bias binding and I really like the result. For the side slits I sewed the side seams to the notches I added earlier, then pressed the seams open, overlocked the edges and topstitched around the openings. I then bar tacked the top of the opening to secure in place. We took these photos at one of my favourite locations in Shetland, Nesbister böd. It was such a beautiful sunny day I only managed to get photos at the back of the böd, out of the direct sunlight, but coincidentally the yellow lichen on the back wall matched the yellow in the fabric, which was cool and totally accidental. I absolutely love this top! I have been wearing it constantly since I finished it. I think the combination of this pattern and this fabric was perfection and I love the bold ikat print, it just feels really cool and modern in these colours. 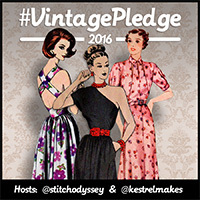 I finished my 2017 Vintage Pledge dress just in time, on the penultimate day of the year. This was an interesting project, it took a long time to make despite not looking too complicated. This was mainly because I hacked the pattern and kept changing my mind about the style details. The pattern was a gift from a family friend last Christmas. I posted a photo of the pattern cover on Instagram earlier this year as I had hoped sharing my intention to make this dress with the sewing community would spur me on to get it done. My major stumbling block was that I couldn’t make a decision about which fabric to use. I had an image in my head of a beautiful version in silk dupion, but as I had never attempted the pattern, that seemed a bit of a risky investment. Towards the end of the year I searched through my fabric stash and came upon this forgotten peach cotton lawn from Atelier Brunette. On finishing the toile I realised the style of the pattern wasn’t really to my taste. The full gathered skirt swamped me and looked very old-fashioned. I shared some images of the toile on my Instagram stories seeking advice from my fellow makers about whether to proceed with the pattern as was, or to hack. The majority chose hack, so hack I did. I drafted a completely new skirt, kept the cool back detail, and modified the front bodice to give me a bit more coverage across the bust. The instructions included with the pattern weren’t the best, and as I had made so many changes I basically had to disregard them and make up my own anyway. The original pattern called for a button closure, but I extended the wrap and added ties, which I prefer. I decided to finish the front edges of the dress with bias binding, rather than facings, and I am please with how this turned out. I admit I did intend to finish all the seams with bias tape too, but I got lazy and overlocked most of the seams instead. I love to finish a garment really carefully so it is as beautiful on the inside as the outside and to extend its life, but I was worried that this dress might not turn out wearable, so I found I was a bit reluctant to invest so much time into beautiful seam finishes. Happily, I am really pleased with how this dress turned out and really surprised by how much I love this colour on me – I really need to experiment more with colour. It was out of my comfort zone, but I’m so glad I went for it, as I think it really suits me. So far I have only blogged about my Dora Dresses, but if you have had a look at my pattern on Etsy, you will have seen that the download includes the option to make a hip length top version also. The best part about the top version is that it is a great scrap busting pattern requiring very little fabric to make, approximately 1m for most sizes. You do also need 0.5m of lining material, but with wider fabrics and in smaller dress sizes you may be able to squeeze the whole top plus the lining out of 1m. The fabric for the version in the photos below was from Backstitch. I bought it quite a long time ago, and had some scraps leftover from another project. This top was made out of those scraps, win! The Dora top is a great layering piece and very versatile. In the summer I would wear my cotton lawn versions by themselves with jeans (it doesn’t really get warm enough here for shorts), but in winter I am layering them up with big cardigans and still getting so much wear out of them. Below I’m wearing mine with this long cosy cardigan I bought a while ago from Celtic and Co. I love their knitwear and it’s made in the UK. I really should try and knit some cables at some point, but I’m still a bit intimidated, maybe one day. If you like the look of the Dora top you might enjoy these posts about my Dora Dresses. The silver one and the green one. Speaking of knitting, I just finished making this hat for Aaron. I had a couple of balls of wool left from this jumper project and the pattern for the jumper came with an additional hat pattern, so I thought I’d give it a go. It’s just a simple hat, as I left off the colour work, but Aaron says it is his favourite hat ever, so not a bad result. I think it looks a bit weird on me, but it really suits him and my dad has already requested I make him one, so I think this hat has been an unexpected hit. I am thrilled to let you know that I have just uploaded my first digital sewing pattern design for sale on Etsy. The pattern is sold as a digital PDF file which can be downloaded and printed at home. It is available in sizes 8-18. Attie and Dora is a sewing pattern company based in Shetland, Scotland. All the patterns are designed, cut and graded by me, Eleanor Coutts. Each pattern is designed with the goal in mind of creating the ultimate between seasons capsule wardrobe. The Dora Dress is a modern take on the traditional slip dress with a 3 part empire line bodice. The pattern includes the additional option to make a hip length top version. The bodice finishes just under the bust and the skirt is slightly flared skimming the body, to give a flattering silhouette. Dora is suitable for makers who already have some experience of garment sewing. It is a relatively easy sew, with no tricky closures to deal with, but looks best when made with slinky fabrics with a lot of drape. I had some help in the development of the Dora Dress and top from my wonderful testers. I couldn’t have done it without you. Megan, Allison, Miriam, Jenny, Georgia, Hannah, Laura, Jennifer, Lizzie and Linda. I also need to say a big thank you to Leanne, Lens in the Lane, the wonderful photographer who captured the photos below. Sewing Blogger and Pattern Designer from Shetland.